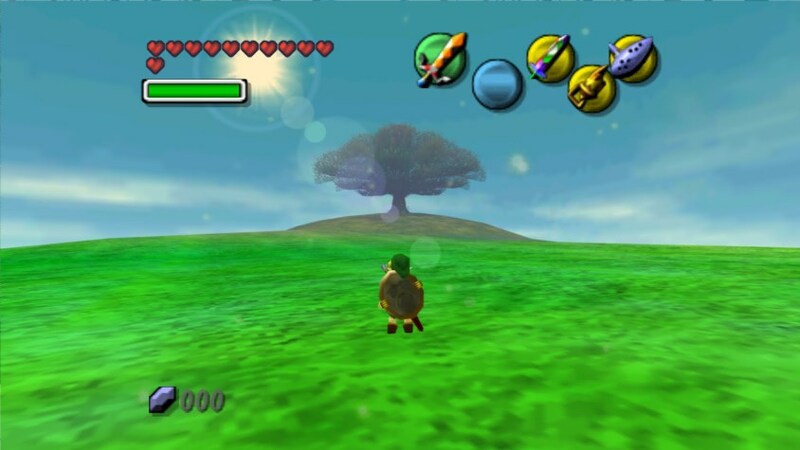 In today’s edition of With a Terrible Fate, I offer a Buddhist reading of “Majora’s Mask” and explain why this is a useful framework for thinking about the game. There are several approaches one can take to interpreting an aesthetic work, but one major dichotomy in methods is the difference in applying a certain interpretive paradigm to a work of art, versus constructing a mode of meaning out of the aesthetic object itself. 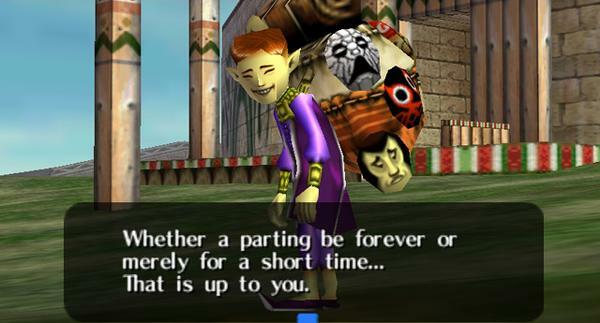 So far, I have mainly implemented the latter approach in analyzing “Majora’s Mask”; in this installment of With a Terrible Fate, I wish to turn to the former of these methods in order effort to approach the game from a fresh perspective. It’s sometimes said that most games coming out of Japan reflect heavy Shinto influence, heavy Buddhist influence, or both. Without taking a stance on authorial intent, I have observed that the whole of “Majora” fits quite cleanly into modes of Buddhist philosophical discourse, which is what I want to illustrate in this piece. I will take up other such interpretations in future posts, which will, I hope, show that Buddhism is by no means the only useful lens to impose upon one’s perception of the game. Nonetheless, I hope to show that it is a natural stance from which to begin this mode of discourse. 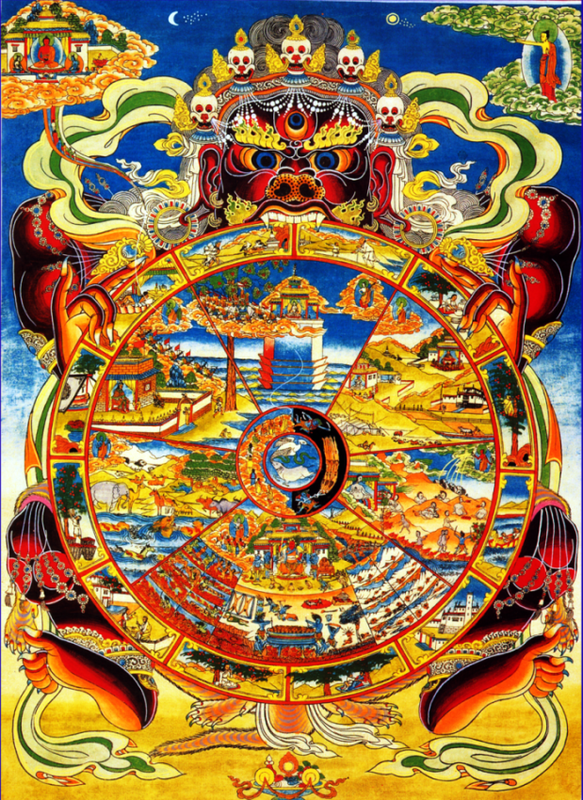 Buddhism conceives of the universe as ‘the wheel of samsara’, literally meaning ‘wandering’; this describes six unique walks of life into which souls are born, live, die, and are reborn through reincarnation. As long as people are bound by suffering to the primitive forces of hatred, greed, and ignorance, they cannot escape the cycle of rebirth in samsara and achieve peace. 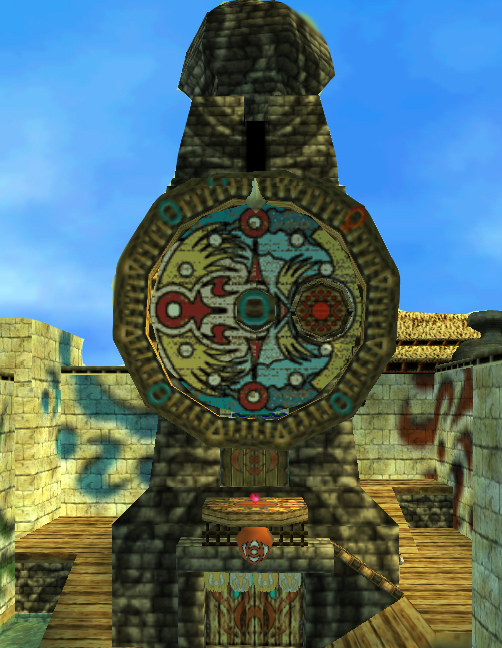 Like the return to new incarnations within samsara, the structure of Termina is always ending yet always being reborn through Link’s use of the Song of Time in order to instantiate new three-day cycles leading up to the apocalypse; the iterative metaphysics of Termina, then, matches that of rebirth within samsara. Yet the analogy goes deeper than this, for beyond being cyclical, the Buddhist conception of time, the mahakalpa, describes cosmic decline and renewal. Just so, the cosmos of Termina is in decline by virtue of its ultimately unavoidable apocalypse, which I have described previously. Though we will return to Link shortly, it is worth noting here that under this interpretation, his quest is fundamentally a fight against the cosmic order, as he attempts to save everyone in spite of cosmic decline. The Realm of Hungry Ghosts is a model for Snowhead. The Gorons all yearn for that which they cannot have: namely, their fallen hero, Darmani. 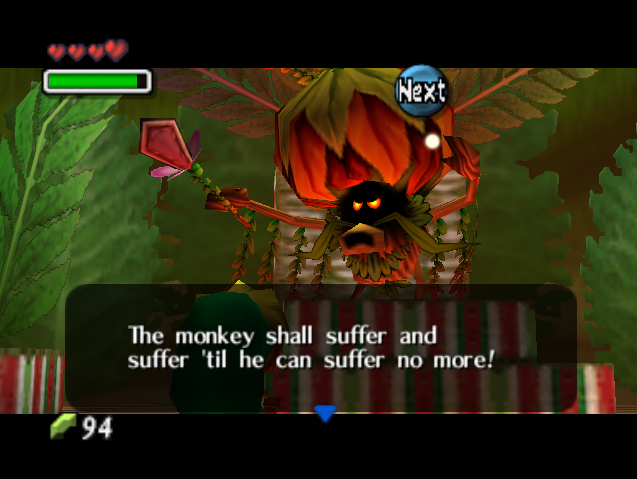 The crying Goron Elder’s son, who feels lost without the presence of his father, aptly represents this same kind of pain. Link’s use of the Goron Mask allows him to appear in the guise of Darmani, and to virtually unite father and son by playing their lullaby for the son; yet ultimately, these are artificial comforts. Like the hungry ghosts, the Gorons crave that which they cannot truly possess. 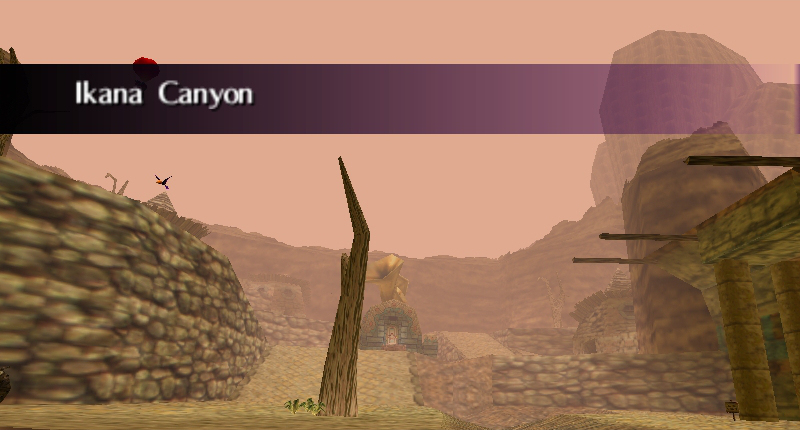 The Realm of Hell is a model for Ikana Canyon. Everyone in Ikana experiences some sort of torment. The landscape is populated by fallen Ikana warriors; Gibdos trapped somewhere between life and death; Garo, persecuted and trapped as invisible spirits; and Igos du Ikana and his men, corrupted by darkness. The Hell Realm is a place of punishment, yet its victims, because of their ignorance, cannot understand the punishment; this imbalance between punishment and acknowledgment manifests in Ikana’s painful-yet-vague history, as in the violent Garo-Ikana war that has faded into myth. The Realm of Gods is a model for the Moon. On the literal level, the world of the Moon is physically separated from the rest of Termina, just as the Gods exist on their own plain. Put aside the status of the Moon Children for a moment: the two glaringly apparent Gods on the Moon are Majora and the Fierce Deity. The moon is their domain, where they engage in battle with the tenor of Gods playing with each other, as I discussed earlier. In this framework, Majora most likely represents Mara, God of death; the Moon Children could possibly be his children, or subordinate deities — but in this article, they are peripheral to the analysis. Yet I have also observed that Link cannot save everyone in Termina in a single three-day cycle. In my own theory I have worked out possible explanations for this dynamic of the game; but it also lends itself to particular implications when we are working within a Buddhist framework. I have already offered an argument for each three-day cycle functioning as its own discrete timeline, and this coheres with the Buddhist framework because we can interpret each timeline as a unique incarnation of people in samsara. People are reincarnated into different walks of samsara, based on the actions taken in past lives (karma) and the general influence of suffering, it follows that the entity manifested as the Postman (as an example) in one timeline is not necessarily the same entity perceived as the Postman in another timeline. What do we glean in particular from a Buddhist reading of “Majora”? There are two directions we can consider here. The first is that an account of Link as a Bodhisattva would give us uniquely useful machinery for explaining exactly why he is so dependent on masks. The philosophy of Buddhism avails itself of a technique called ‘skillful means’; roughly glossed, this means that, in order to teach the same thing to different people, one must teach using methods particular to the individual being taught. Skillful means can sometimes even explain apparent lies and deceit, when an Enlightened and compassionate teacher implements them for the sake of bettering another life. 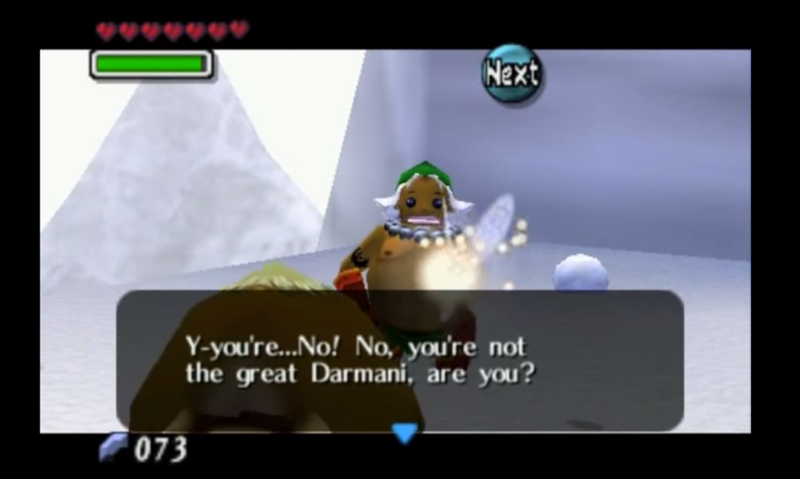 So, for example, we might rightly be confused as to why Link poses as Darmani to his beloved Goron tribe that mourns him; skillful means would succinctly explain that Link needed to deceive them in order to gain access to the Snowhead temple, where he could free the Giant and restore balance to Snowhead — or, alternatively, that for the Gorons to ultimately be healed of their pain and achieve peace, they needed at that moment to see the one for whom they yearned.